Sanvari Fashion is the leading and No.1 Manufacturer & Supplier of Wholesale Woman's Clothing In Surat, India. We are the trusted Company with The best service in Surat which is one of the biggest Textile hub in India. We supply woman's Clothing such as Wholesale Sarees, Lehenga, Kurtis, Salwar Kameez, Dress Materials, Western Wear, TopsTunics, Palazzo etc,. You can find a wide range of the materials at Sanvari Fashion. From Sarees to Lehenga all the Varieties of Products, Layouts, Patterns all are available at sanvari Fashion in a wide range. All you have to do is log onto Sanvari fashion online wholesale store and get the one's of your choice. As saree is the most preferred and traditional attire in India. Sanvari Fashion see that the sarees available at our store are in trend. Our designer are in with the on going trend and fashions. 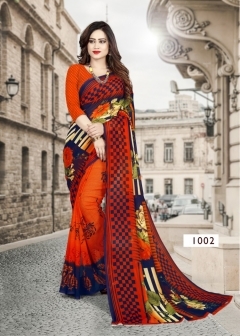 We can get the latest wholesale sarees catalogs in Sanvari Fashion. So, visit Our wholesale store and select form the broad range of Wholesale saree designs catalogs at very cheap price. We supply the best quality of Surat sarees at a very low prices which is even affordable by a common man. Enjoy your sarees shopping at Sanvari Fashion with a discount of flat 60%. Kurtis the most loved attires by the younger Indian woman. They are never out of the trend. They are stunning and gorgeous and allure ur look. Wholesale kurtis can be worn as casual, daily wear & to any occasion or official wear.You can find the vast range of Wholesale Kurtis designs, Catalogs, patterns, layout and a different unique colors at Sanvari Fashion in extremely low prices. Designer Kurits, Cotton kurtis, printed kurtis, long gown kurtis are available in a wide range in Sanvari Fashion. So, Grab your favorite Kurtis at Sanvari Fashion at Low price. Lehenga are the conventional & traditional attire Which are mainly used for occasions. Wholesale Lehenga is most popular in the ladies of India. At Sanvari Fashion you can get the latest designer lehenga of your own choice within your affordable price. You can also explore through the latest Wholesale Lehenga choli designs, catalogs, layouts, and unique colors which are of best quality in Surat, India. Get the wholesale lehenga from Sanvari Fashion and become the center of attraction in any occasion or festive season. You can also get the latest designs catalogs of wholesale dress materials, salwar suits,Western wear at cheap price in Sanvari Fashion. We also have the delivery services in Sanvari fashion. We deliver to all parts of the India & globe. So, logon to Sanvari Fashion and be happy in shopping with us.